Sarah Washburn is an active chamber and orchestral musician, and a dedicated teacher to students of all ages. She is a founding member of the West End String Quartet, and teaches at Wesleyan University, The Hartt School Community Division, and her own private studio. With the WESQ, which celebrates it’s 10th Anniversary season this year, she has performed at the Bravo! Vail Valley Music Festival, SoundFest on Cape Cod, on the Hartford New Music Festival, and Wesleyan’s Ives Vocal Marathon. WESQ has recently performed at The Arts Institute of Western Maine, Wesleyan University, Capitol Community College, Trinity College and at The Hartt School. As part of their commitment to education, the WESQ conducts a series of masterclasses at The Hartt School, and teaches chamber music at Wesleyan University. 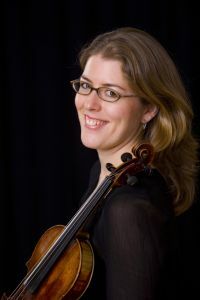 As an orchestral musician, Sarah has performed in the Hartford, New Haven, Waterbury and Vermont Symphony Orchestras, and as concertmaster of the Manchester and Hartt School Symphony Orchestras. She has performed in the pit at Hartford Stage, Goodspeed Opera House, and with Broadway touring companies. Ms. Washburn earned a B.Mus with honors from Boston University, with a minor in French, and a M.Mus from The Hartt School at the University of Hartford, where she studied in the 20/20 Honors Chamber Music program. She lives in West Hartford, CT, with her husband, composer Ryan Jesperson, their daughter Amelie, and their cuddly dog Charlie Murphy.